The men range in age from their 60s to well into their 90s but you’d think they were all in their 20s the way they partied at last night’s annual gala dinner-dance at the Gelber Centre. President Sydney Kronish served as emcee along with funny-man Manny Young and chairman Joe Presser. The ballroom was packed to capacity with hundreds of members along with their spouses and significant others. The dance floor was filled to capacity and guests filled every corner of the hall in dance and merriment. The joy of the evening was punctuated by the very sad and sudden passing of club VP Bill Surkis. Bill was slated to be presented with the Man of the Year award for his great efforts in the organization. Having passed away suddenly just one week ago, his brother and members of the family attended to receive his award and support and encouragement from the 500 member club. Bill will be missed by his many friends in the club and by the city. MNA David Birnbaum’s declaration in the National Assembly on the occasion of the 29th anniversary of the Men’s Club was read aloud and he announced that he is working on getting his “chef”, the premier, to come and address the group. Artist Phil Kurtz, a member of the organization who previously donated an oil painting depicting 150 faces from the Men’s Club and their spouses offered up another one of his works that he painted specifically for the occasion. He described the abstract oil painting as one depicting the active participation, creativity and building of community by his fellow members. Certificates were handed out to all the 90 year olds, door prizes of golf foursomes were given out and special awards were presented to those members who have given much time and energy. Former MNA Lawrence Bergman was in attendance with Vivian Konigsberg. Kudos to President Sydney Kronish and his executive on a sensational evening and a unique and exemplary organization that is active all year long, even down south over the winter. Their Thursday breakfast speakers see upwards of 200-300 in attendance. Day trips around Montreal are generally sold out. Theatre evenings are very popular. I was amazed at seeing over 200 members when I was the guest speaker for their winter luncheon in South Florida a couple years back. MONTREAL – Painting one portrait can be a lengthy, painstaking process, but what about 185 – and all on the same canvas? That’s the task Phil Kurtz undertook, and he is not a young artist looking for commissions. He’s 84, and his intention from the start was to donate the finished work. Kurtz, a retired chemist, did just that at the Côte St. Luc Senior Men’s Club gala, held in October at the Gelber Conference Centre. His 7-1/2-foot-wide painting depicts 185 real people, their faces all minutely and realistically portrayed. They, like Kurtz, are members of the club. He never thought the project would become so ambitious, nor that he would be under the gun, so to speak, to get the painting delivered by the deadline set by club president Syd Kronish. The club wanted a painting to be installed at the Côte St. Luc Aquatic and Community Centre, where it holds its meetings. The idea was to convey the happy times the membership – which has grown to over 500 – enjoys there. Kurtz explained that at first he wanted to capture the membership – a significant number of whom are 90 and better – enjoying themselves with their female significant others at one of the club’s social functions. “The original concept was to paint a dynamic arrangement of people talking and gesticulating while enjoying coffee and danish,” he explained. His proposal was to rough in a layout while wintering in Florida and, upon returning in the spring, collect photos from the members and their wives and girlfriends, and fill in the picture. Besides the time pressure, many more members than he expected wanted to be included. Even with a large canvas, Kurtz realized he would have to abandon the convivial scene he had had in mind and make this into a mass portraiture if he was to get everyone in. “This included some very late submissions that I could only include as small portraits in the background,” he said. Although the faces are faithful to life, Kurtz took the liberty of playing costume designer and dressing his subjects in clothing, the colour and style of which he felt would be most esthetically pleasing. There were no complaints when the painting was unveiled at the gala and formally presented to then-Côte St. Luc mayor Anthony Housefather. On the contrary, members were delighted as they gathered around the unveiled painting, delighted with the results. If they had trouble finding themselves, Kurtz could quickly point them out without needing to refer to any plan of the layout. “When you spend so much time with these people, you sort of become embedded with them,” he said. Kurtz has enjoyed art since he went to Baron Byng High School, but earning two degrees and then making a living left little time to take up a brush until his later years. He is essentially self-taught, not only in practice, but also in his study of art history and criticism. “Lessons would be too slow,” Kurtz said. He has been attending some of the classes artist Phil Goldberg gives to the club, which is entirely membership-run. Goldberg commented that he is awed by Kurtz’s talent. The painting will hang at the top of the staircase at the aquatic centre. In accepting the donation, Housefather said the work will be an inspiration to all who use the centre’s facilities and was especially meaningful as it was created by a local artist. Once again the Cote Saint-Luc Men’s Club have pulled off an incredible event in last night’s sold-out annual gala. Celebrating the dynamism of the 500 plus members of this amazing organization is a yearly tradition. President Syd Kronish follows in the line of dynamic and creative gentlemen that have kept this club at the forefront of seniors leisure, recreation, learning and activism for more than a generation. This year’s honouree is Peter Sternberg. A longtime member of the club, Peter has been active in many facets of communal life for a very long time. He’s not only a good friend of my father’s, but my own interactions with Peter stem from his participation as a volunteer Citizens on Patrol member. Keep on going men (and ladies too) of the CSL Men’s Club. In good health and with big smiles. Cote Saint-Luc Mayor Anthony Housefather will go to great length to connect with his constituents. 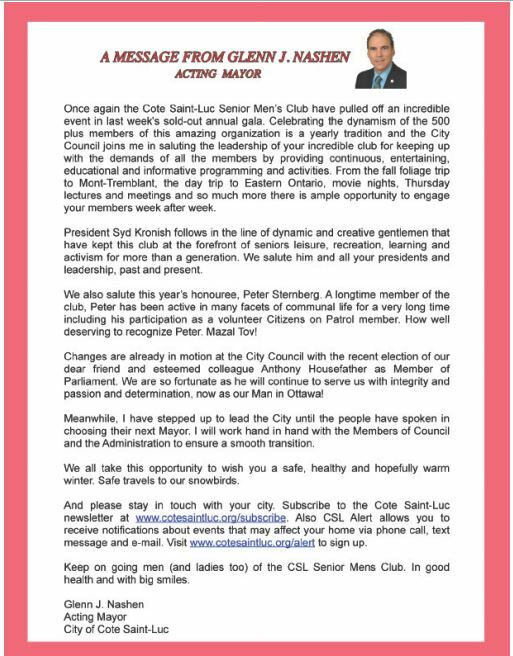 That was the case this past week as the mayor traveled to South Florida to spend a few days poolside and to meet with the CSL Men’s Club during their annual winter luncheon. Thousands of CSLers spend their winters down south and the greatest concentration can be found in the Deerfield Beach area with several hundred being residents at Century Village. CSLers can easily be spotted at shopping malls, golf courses, restaurants and shows in Hollywood, Hallandale, Pompano Beach, Boca Raton, Fort Lauderdale, Boynton Beach, Delray and neighbouring communities right up to West Palm Beach. 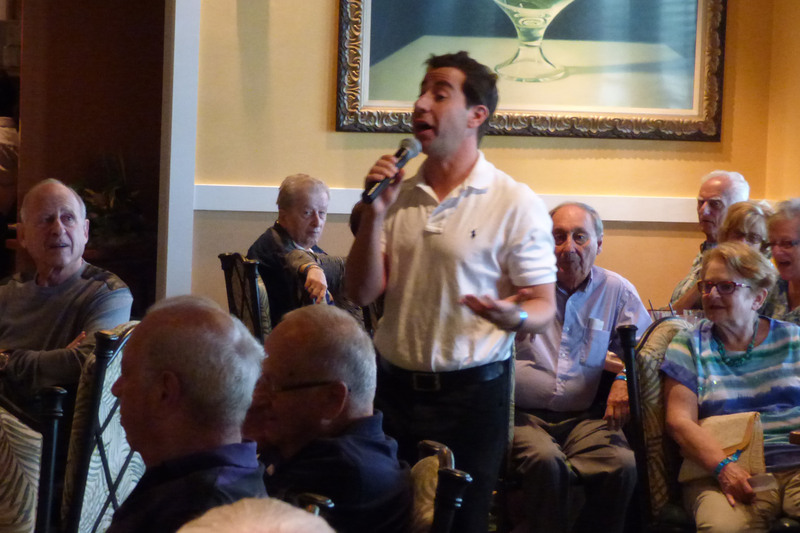 Over 250 of them gathered last Wednesday, along with their wives, for the annual winter luncheon, at the posh restaurant in the Seminole Casino, to dine and meet guest speaker Mayor Housefather. The mayor spoke to the capacity crowd about the progress of the City of Cote Saint-Luc over the last nine years since demerger and plans for the future. He discussed antisemitism and the global threat of terrorism and how governments needed to balance quick action with respect for civil liberties. He also discussed human rights and the importance of protecting those rights at home and around the world. The pivotal question during the exchange portion was asked by former club president Peter Sternberg. 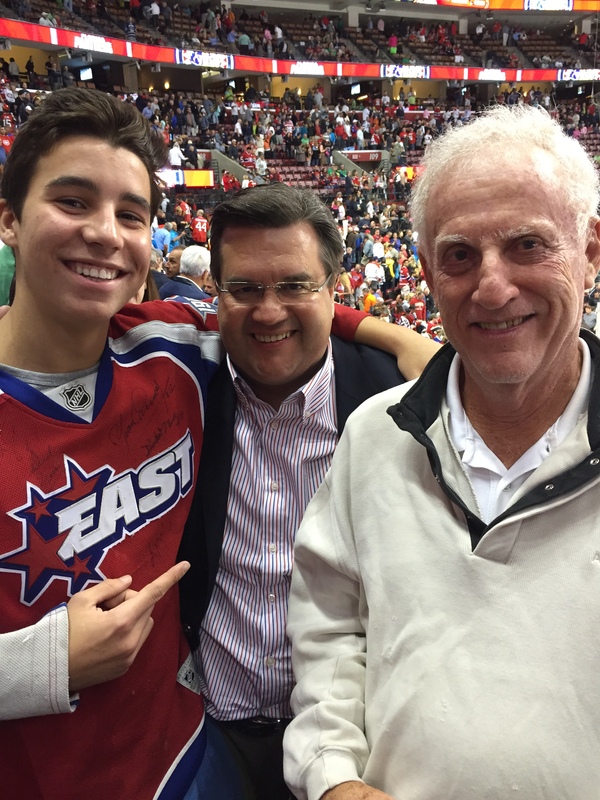 “What can voters do if they want to support you [Housefather] as the Liberal nominee in the next federal election while at the same time wanting to support Prime Minister Stephen Harper for his steadfast backing of Israel?” Sternberg asked. Housefather gave a reasoned and convincing response in saying that electing him to represent our constituency will lead to the utmost support for Israel, without any doubt. Remember that Housefather was educated at Herzliah High School, has traveled to Israel several times, recently competed in the Maccabiah games there winning a staggering seven medals and speaks Hebrew very well. The mayor was flanked by CSL leaders including club president Sydney Kronish, past president Sidney Margles, program chief Mark Kotler and CSL Men’s Club paparazzi Sid Birns and Jack Frank. My parents, Phyllis and George Nashen, were in attendance along with many of their friends including Roz Axelrod and Jack and Lil Margolis. I was last year’s guest speaker in Boca and was so impressed at seeing 200 CSLers show up for this luncheon. It was great fun meeting and speaking with our elder leaders and neighbours and I look forward to being invited again in the future, perhaps joining my friend Anthony Housefather at the podium. Bravo to the Men’s Club and its leaders, to our active residents and our eager and talented Mayor Anthony Housefsather.